Don’t forget: the book mentioned below is available at 20% off for tablehopper readers for two weeks following this mention at Green Apple Books—simply use the code “tablehopper” at checkout (either at the store or online!) for your discount (if ordering online, just write “tablehopper” in the order comment field—when they process the order, you’ll get your discount). 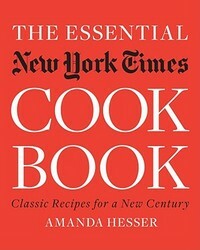 A few weeks ago, I had the pleasure of sitting down for a brief chat with Amanda Hesser, editor of The Essential New York Times Cookbook. In the cramped upstairs offices of Green Apple, Ms. Hesser—gracefully recovering from the rain and lack of taxis—answered questions about the book, the editing process, and the effects of testing recipes on her young twins. By way of introduction, this book, at 4.5 pounds, is a “doorstop”: 930 pages, over 1,000 recipes, lots of charts and graphs, and substitution lists. Asked what differentiates this from other “doorstop” cookbooks, she cited many features. First, the book is culled from the archives of The New York Times, going back 150 years. For most of those years, most recipes were submitted by readers, usually women. So there’s a historical bent to the book, as revealed in the brief intro to each recipe. It was only in the 1970s or so, Ms. Hesser told us, that food writing graduated from the “women’s pages,” and the paper hired food writers and published recipes from chefs instead of readers. To help decide what recipes to include, Ms. Hesser did some crowd-sourcing, asking readers to submit their favorite recipes. She received 6,000 suggestions (four of the top five were desserts, and four of the five were over 20 years old). Because of this, the recipes are truly diverse. Unlike some “doorstop” cookbooks, this is not just a contemporary take on classic recipes. Rather these are classic recipes. Asked if she saw anything to rival the recent cupcake or charcuterie crazes, she mentioned that there was a period with lots of terrapin (turtle) recipes. Finally, Ms. Hesser described how she personally tested 1,400 recipes. Her husband and young twins were the beneficiaries, eating everything from Laotian Catfish Soup to Bosiljka Marich’s Serbian Torte. While not all passed the twin test, the 1,000 recipes that made the cut have been carefully proofed, and joyfully consumed, in a home kitchen. The distinguishing feature is, indeed, the historical nature of this unique collection of recipes. It is NOT built around today’s tastes to a large extent (though the lion recipe in the archives did not make the book, alas). Rather it gives you an opportunity to explore America’s culinary history, discover old dishes, and try something new. And the book could be read like a narrative, which Ms. Hesser said was one of her goals.